Mottoes of Scottish clans, originally identity-forming signs, become open representations in Constanze Schweiger’s production for BLACK PAGES. In this case, braveness, honesty, strength, courage, discipline, cautiousness, advertence, faithfulness, zeal and love are qualities which are oriented towards the continuity of a group in their social function and are consequently in line with the preservation of patriarchal systems. Reading the publication, particular memories and familiar sensations likewise emerge as a peculiar impulse for our own interpretation. The formative interventions behave oddly, updating and value-free. BLACK PAGES is a monthly released artist-fanzine, each edition with a print run of 300. BLACK PAGES comes in A5 format, including 20 pages, printed in black&white. BLACK PAGES invites one artist for collaboration and names the edition after his/her forename. 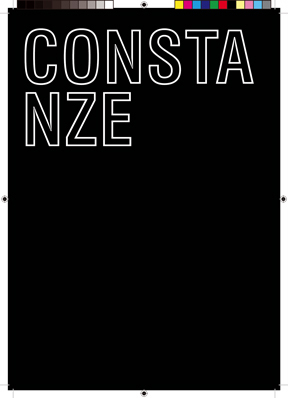 BLACK PAGES continues with issue#05 CONSTANZE featuring Vienna-based artist Constanze Schweiger. BLACK PAGES is available at the Salon für Kunstbuch in Vienna, Florence Loewy / Books by Artists in Paris, Inc. livros edições de autor in Porto, Adreiana Mihail Gallery in Bucharest and at Printed Matter, Inc. in New York. BLACK PAGES is a project by Vienna-based artists Christoph Meier, Ute Müller and Nick Oberthaler. Release and Opening: Friday, November 13, 2009, 7pm – with mittwochsbar!